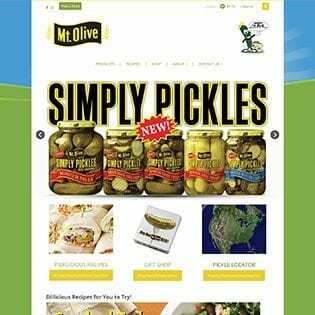 MtOlivePickles.com is the same address, but the new location for all things Mt. Olive Pickle. See what’s in our product line, browse an array of new recipes and videos on how to make them, and check out the kid-friendly activities and pickle-themed educational materials for teachers. And, order either of our gift packs online. All of this is now in a mobile-friendly environment, so you can take Mt. Olive Pickle wherever you go! 4 Responses to Welcome to Mt. Olive’s new website! Hello, do you have a Mt. Olive Pickle tee shirt? If so please advise the price. Billy, we do sell t-shirts in our gift shop. They range from $7-9. To order, call our gift shop at 800.672.5041.